The travesty in Helsinki is not the end of the story. It is closer to the beginning. President Donald Trump’s obsequious performance during his joint press conference with Russian President Vladimir Putin in Helsinki today was a national disgrace. And it spells dangerous times ahead for the world. 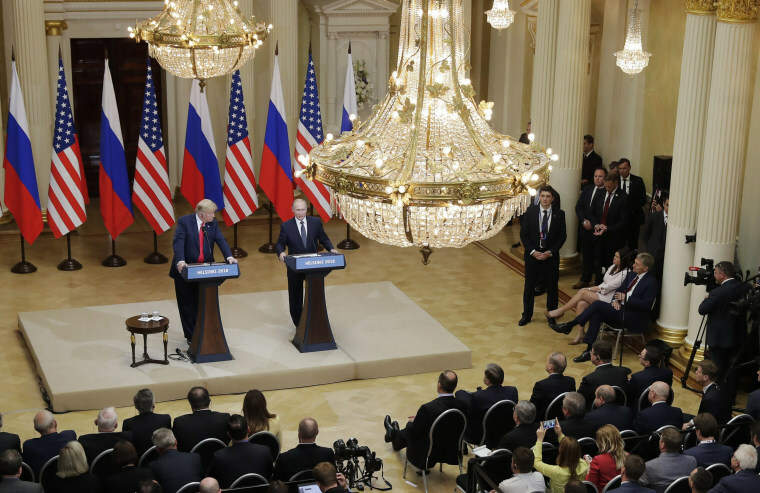 The event has certainly given pundits plenty to analyze (and critics to attack), although the primary focus of pundits will likely be Trump’s determination to validate Putin’s laughable denials of Russian interference in the United States’ elections. Trump’s own intelligence officials, who have testified in recent days to Russia’s past and ongoing cyberattacks against the United States, were thrown under the bus in front of a global audience. Special counsel Robert Mueller’s recent indictment of 12 Russian operatives was dismissed as so much fake news. The American president’s utter silence on Russia’s destabilizing and aggressive actions against our democratic European allies bespeaks a dangerous shift. So focused was Trump on hyping his victory over Hillary Clinton and advancing the claim that his campaign did not collude with Russia, that he evidently declined to confront Putin on past interference or even warn him against its repetition. That’s appeasement of the first order. But it is not only Trump’s shameful capitulation to the Russian president that is a cause for worry. This summit must be viewed in a much broader context. Trump’s failure to push Putin on election interference represents a cynical betrayal of U.S. democracy, but at least one can chalk that up to Trump protecting his own political interests. The American president’s utter silence on Russia’s destabilizing and aggressive actions against our democratic European allies, however, bespeaks a more dangerous shift. What is unfolding before our eyes is not the haphazard lurches of an ill-informed and possibly compromised president, but rather the potential dawning of a completely new global era, a fundamental reshaping of the international order. Trump clearly wants to dismantle the Western alliance. He manufactured a crisis at last week’s NATO summit only to claim to have resolved it after two days of drama. The details are of only marginal importance. But his true attitude could not be clearer: He does not believe in the concept of mutual obligations between allies. He thinks our allies take advantage of us. He complains that NATO is worse than NAFTA (whatever that means, but we all know what he thinks of NAFTA). He called the European Union a foe. He seeks purely transactional relations with even our closest partners. Over the past few months, he has also consistently trashed and insulted our allies, humiliating good friends like Angela Merkel, Theresa May and Justin Trudeau. He has undervalued their contributions to our security, forgetting that the only time NATO’s Article 5 (which declares that an attack on one is an attack on all) has been invoked was after 9/11, and that troops of many NATO nations have died fighting alongside U.S. forces in Afghanistan. He has gone so far as to threaten to withdraw U.S. troops from their bases in Europe. This rhetoric, taken in concert with his conciliatory posturing towards Russia, is building up hostility to NATO among his supporters, who may buy Trump’s misinformed notion that we are being fleeced by an alliance that has undergirded Western security for the past 70 years. The damage won’t disappear when Trump does. In today’s press conference, Trump’s passionate desire for “a good relationship” with Putin led him to swallow his tongue on Russia’s illegal annexation of Crimea and its ongoing occupation of Eastern Ukraine; on the Russian military’s alleged downing of a Malaysian airliner over Ukraine; on alleged Russian chemical weapons attacks carried out in the UK. Any previous president would have at least restated U.S. positions on these issues and made sure that the American press and public knew he had confronted the Russian leader over them. Not Trump. Some say Trump will ultimately be restrained by his advisers, who include Russia hawks and NATO supporters. Don’t buy it. Counting on Trump’s strategic understanding or his personal integrity to not follow through on what he truly believes is a bad bet. Some say Trump will ultimately be restrained by his advisers, who include Russia hawks and NATO supporters. Don’t buy it. If Trump takes his policy inclinations to their logical conclusions, the implications are innumerable. Russia will menace the Baltics and paw at other Eastern and Central European states. We will witness the breakdown of NATO’s joint defense structures. Deprived of European military bases, U.S. power projection in Europe and the Middle East will be weakened. German foreign policy might become less restrained and long suppressed intra-European conflicts could reignite. And that list just scratches the surface. Because for all the challenges that come with alliances, no sane person or American political leader has contemplated recklessly elevating our ties with Russia over those with our allies. And yet, it now appears that this could happen. Trump doesn’t know the history or strategy of the alliance. He doesn’t listen to experts, including those on his own staff and in his own party. He aspires to friendship with Putin, who despises NATO and craves its demise. He loves the drama of the outrageous move or statement or allegation that dominates cable television coverage even when it is easily debunked. We are potentially on the verge of a cascade of events that will devastate our interests, weaken our leadership, abandon our allies, embolden our adversaries and make the world a darker and more brutal place. All of which suggests the travesty in Helsinki is not the end of the story. It is closer to the beginning. We are potentially on the verge of a cascade of events that will devastate our interests, weaken our leadership, abandon our allies, embolden our adversaries and make the world a darker and more brutal place. We have done no planning for this course of action. No one thinks it is a good idea. But one man, whose knowledge and values are wanting, whose motivation is suspect and whose supporters follow him blindly, could take us there. The brain wants to tell us that these events, if not within the range of historical norms, are temporary aberrations, reversible deviations from decades of U.S. foreign policy. The gut knows better. Listen to the gut. Daniel B. Shapiro is a Distinguished Visiting Fellow at the Institute for National Security Studies in Tel Aviv. He served as U.S. Ambassador to Israel and senior director for the Middle East and North Africa at the National Security Council during President Barack Obama's administration.